Synopsis: Killjoy is a vehicle for my ongoing cartoon memoir project, Catch a Fairy, a gradual accumulation of stories and vignettes from my childhood. On the cover of this first issue it says 'A Comic for the Discerning Nostalgist', well that was about it. I don't even remember looking inside, though I probably did but by the time I did that I'd already bought it in my head so unless the insides were very disturbing it was coming home with me. Again this was also part of my September 2014 York, United Kingdom, loot. The cover is made with slightly thicker paper than the interior pages. The interior pages are bleached stock paper. This A5 size booklet contains twenty pages and is kept together with two evenly spaced saddle stitches. Unfortunately my copy has been folded askew by the printer making the bottom ten pages stick out slightly at the top and the top ten pages stick out of the bottom. I can't judge whether it's just my copy because there was only one copy left at comic store in York. 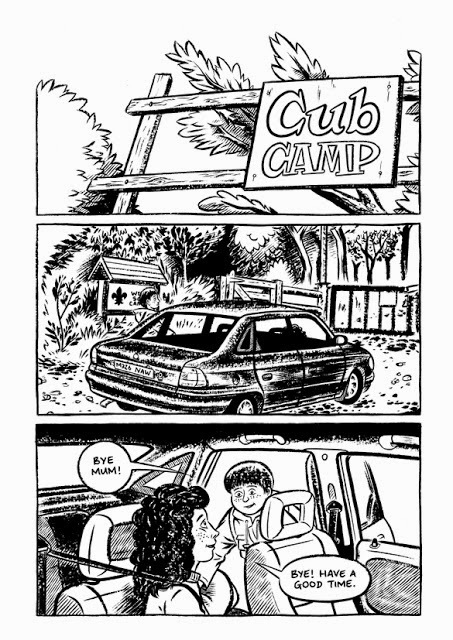 This booklet contains the autobiographical story called 'Cub Camp', it features Robert Brown on his first Cub camp, away from his parents probably for the first time and all the feelings that go along with that. The story feels like you've put on your old comfortable slippers and are sitting on the couch with a blanket reliving past camp(s) with a hot cup of cocoa in your hands. It brought back a couple of memories for me that I'd have thought lost. The story made me smile. What I missed was a deeper investigation into the feelings that are portrayed so well on the pages. The artwork had so much emotion and I missed that in the narrative. Some things that happen aren't explained (fully) which gave me a feeling that I was missing out on something important. The black drawings are really rich in detail and each panel on each page is well drawn, especially the facial expressions. I like the actions chosen to depict the story line. I love the full page artwork on page six. I don't really know why but I keep coming back to look at it. Perhaps some blocked memory about abseiling nagging at me. Who knows, it's just very well done. Everything is clearly visible, not too much black and not overly enthusiastic in the details, but a very realistic style. Brown is a real artist and it shows. I like that it's made me think of camps I've been on and adventures I had there. It has a nostalgic feel about it. That alone was worth the price of the comic. I'd definitely buy it again. 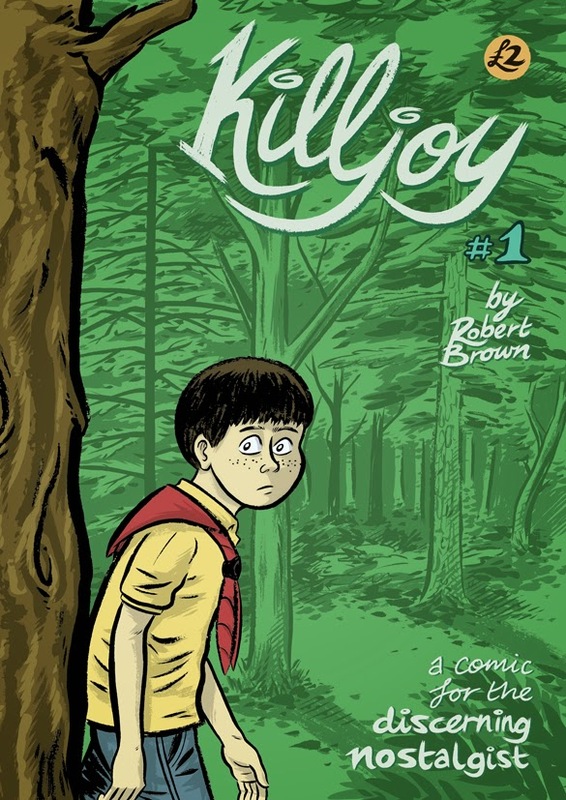 The wonderful art fits the story perfectly and the lettering is never in the way or intrusive. I like that some pages have conversations, some have a narrative and some have no words whatsoever. It all flows nicely and it's an easy read for a warm evening while sipping tea and eating a stroopwafel. If you can't get them from your local comic shop in the UK then your best bet is to go online and buy it from Robert Brown himself through his website store as of September 2014 he still had some left. You will also be able to see some sample pages on his website. This first issue will set you back 2GBP plus shipping.